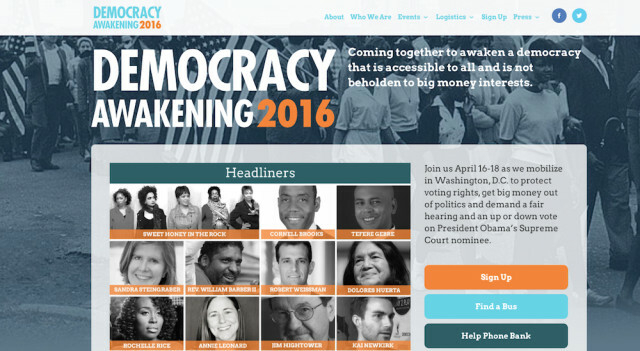 Image from the Democracy Awakening website. This weekend, thousands of people are expected to converge on Washington, D.C., as part of what is being called “an unprecedented movement to demand a democracy that works for all Americans, one in which everyone has an equal voice and elected officials are accountable to the people, not the wealthy,” organizers say in a news release. “The landmark three-day mobilization” scheduled for April 16-18 is called Democracy Awakening, the release says. “[It] will bring together two advocacy communities in one movement. Together, they will press for reform proposals focused both on restoring and expanding voting rights protections, and curbing the influence of wealthy interests and corporations on elections,” the release adds. In Sarasota, local groups have collaborated on hosting a solidarity rally “to make sure the message gets through to our elected officials,” the release continues. That rally and a press conference will take place on Friday, April 15, at 4 p.m. outside U.S. Rep. Vern Buchanan’s office at the Federal Building, located at 111 S. Orange Ave. in downtown Sarasota, the release continues. Among the groups endorsing the local action are the Manatee-Sarasota Sierra Club, the Manatee Unitarian Universalist Fellowship Social Action Committee, the Peace Education and Action Center, the Nation Group, National Nurses Organizing Committee/National Nurses United-Florida, American Association of University Women-Manatee Chapter, In Granny D’s Footsteps, United Nations Organization, Occupy Bradenton, Sarasota Alliance for Fair Elections, the Rainbow PUSH Coalition, the Manatee County NAACP, Newtown Nation, and the Unitarian Universalist Congregation of Venice Social Justice Committee, the release says. In Washington, D.C., more than 200 groups representing a diverse array of issues are organizing Democracy Awakening, the release points out. The lead organizations are the American Postal Workers Union, Common Cause, Communications Workers of America, Democracy Initiative, Every Voice Center, Food & Water Watch, Franciscan Action Network, Greenpeace, NAACP, People For the American Way, Public Citizen, Student Debt Crisis and U.S. PIRG, the release says. A list of all endorsing organizations is available here. “City by city and state by state, a national movement is growing to ensure voters are fully heard. In communities throughout the country, voters have turned back efforts to impose discriminatory barriers to voting, won measures for public financing of local and state elections, and passed resolutions calling for a constitutional amendment to overturn the Supreme Court’s Citizens United decision and other rulings,” the release points out.